Who knew this humble vegetable was so versatile? Latest research suggests the antioxidants in cucumbers have an anti-ageing effect. They are also a great source of anti-inflammatory vitamin K and the mineral molybdenum, which helps keep blood sugar balanced. The nutrients are most concentrated in the skin and seeds, so don’t avoid these parts, but choose organic where the skin does not have a synthetic wax coating. Save that cucumber garnish on the side of our plate as it might come in handy if you’ve just enjoyed a spicy meal. Cucumber is great for getting rid of bad breath. Take a slice of cucumber and press it to the roof of your mouth for about 30 seconds. The natural phytochemicals will kill the bacteria in your mouth that cause halitosis. Every schoolgirl knows that cucumber is brilliant for tired eyes, and it’s no coincidence that many top beauty brands include cucumberin their products. As a skincare aid, cucumber is excellent. It’s highly diuretic so is great for cleansing the skin and it contains silica which helps prevent fluid retention. You can make an excellent facial cooling toner by juicing the cucumber, or mash the whole thing to make a refreshing face pack. A quick-fix solution when you are in a rush and can’t find the shoe polish is to rub a slice of cucumber over your shoes. The cucumber’s chemicals will provide a quick and durable shine that also repels water. Cucumber works well on squeaky hinges and unfogging steamed up bathroom mirrors too! Go green by using your out-of-date cucumber as a cleaning product. Use a slice to clean your stainless steel sinks. Just rub it along the surface and you’ll find it’s a gentle way of getting rid of tarnish and making the sink shiny again. The skin of the cucumber can be used to rub off the pen marks from the walls and, if you mix the flesh with some household salt, you have a gentle but effective scourer for ceramic baths and sinks. Fresh cucumber will not only cool and soothe your skin but also hydrate it. 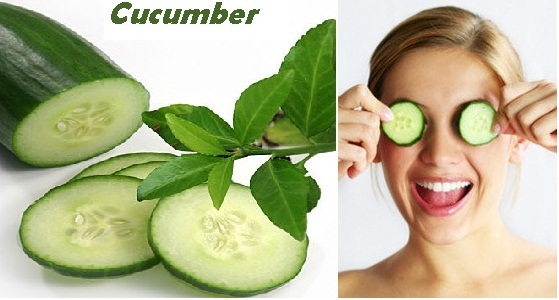 Cucumber contains the mineral potassium, silica and sulphur, which have a cooing effect on the skin. Lie down and apply slices of cucumber to the affected area. Sunburned skin is sensitive and dry, so make sure the cucumber is not too cold and that you have romoved the scratchy peel. Cucumber balance the acidic pH of alcohol. They also provide antioxidants, vitamins and have anti inflammatory benefits. A cucumber is more than 90 per cent water – what your body craves after alcohol – while B vitamins and carbs provide energy after a late night.